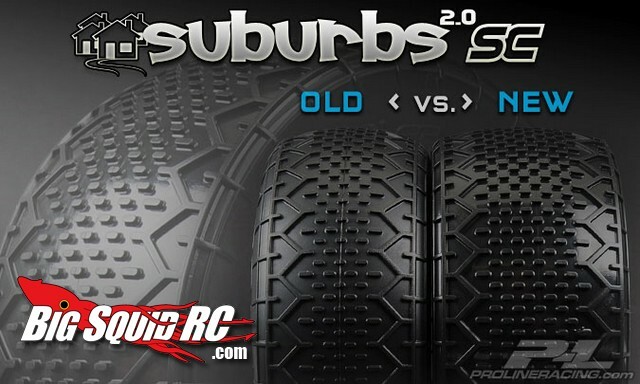 New Pro-Line Suburbs 2.0 SC MX Blue Groove Tires « Big Squid RC – RC Car and Truck News, Reviews, Videos, and More! There is only one leader in the tire game and that is Pro-Line. Part of being a leader is making tweaks to an already good design to make it even better. Such is the case with Pro-Line’s new Suburbs 2.0 SC short course truck tires. The Suburbs were already a very popular high bite/blue groove tire, the 2.0 version is wider for more traction and also features more pins and a deeper tread. If you run on blue groove outdoor tracks or on indoor clay you’ll definitely want to try a set of the new Suburbs 2.0 SC’s. The part number for the MX compound Suburbs 2.0 SC’s is #1171-16 and expect a street price of around $25 per pair. More information can be found by visiting Pro-Line’s Official Website. Have you read our Pro-Line performance transmission review? If not check it out HERE.